A couple of days ago, I posted some initial reactions of the 2009 NFL free agency period here on FEGNS. Since then, there have been more signings, wheeling and dealings, and tidbits of news. So as I did before, I’ll break down some of the recent signings that I didn’t address already. Deal(s): The Broncos signed LB Andra Davis to a 2 year deal and also signed S Brian Dawkins (pictured right) to a 5 year, $17 million deal. Analysis: The Broncos were in need of inside linebacking, and Davis fits that bill well. He’s also a much cheaper linebacking option than Ray Lewis and other still available linebacking options might be. Perrenial Pro-Bowler Brian Dawkins leaves Philidelpha behind after 13 seasons there. He was a fan favorite, and I’m sure there are many fans that are heartbroken to see him go. With that said, Dawkins is still a great player that will make an impact on any team he’s on. Rating: “B+” … These are good signings for the Broncos as they beef up their defense with the addition of both of these veterans. Deal(s): St. Louis Rams made Jason Brown (pictured left) the highest-paid center in the NFL, signing him to a 5 year, $37.5 million deal. Analysis: After giving up 45 sacks last year (6th most in the NFL), the St. Louis offensive line receives a big boost with this signing, as Brown was widely regarded as one of the best offensive linemen available. Brown is versitile enough that he can line up in any of the 3 internal linemen positions, and this versitility makes him extremely valuable to a team that just gives up way too many sacks. Rating: “B” … Although it’s hard to say that one signing and one player can change the effectiveness of an offense or defense, Brown is the type of player that will make a huge immidiate impact for the Rams. Really good signing by itself, but hopefully for the Rams sake, this is the beginning of many more good signings, and not the end. Deal(s): The Cowboys signed LB Keith Brooking (pictured left) and aquired John Kitna via trade with the Detriot Lions. Analysis: The “Boys” were in need of linebacking help, and despite rumors circulating around for the last week or so, they wouldn’t be able to sign Ray Lewis without making some serious roster changes. Brooking gives them an experienced veteran linebacking presence who is still an effective defensive asset. John Kitna (pictured right) was acquired by trading starting cornerback Anthony Henry, and will supply depth at the quarterback postion. While a starting defensive player is seemingly a lot to give up for a backup quarterback, the Cowboys realize now that Romo may not necessarily be the savior they thought he was. Rating: “C+” … While Brooking will help out the Cowboys’ defense, losing Henry will not. 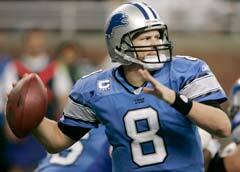 Kitna is a decent backup option, but will not be the one to lead the Cowboys to the promised land if Romo slips up. These transactions are purely average, but the Cowboys are a team with a lot of money already spent, so that isn’t unexpected. Deal(s): The Dolphins signed S Gibril Wilson (pictured right) to a 5 year, $27.5 million deal less than 10 days after he was released by the Oakland Raiders. Analysis: The Dolphins were much improved last year after a terrible 2007-08 season. The signing of Wilson is another step in the right direction. Wilson gets his second multi-year contract in as many years. Rating: “B” … The value and price of this deal is right. Wilson is a good player that was the victim of a cap crunch in Oakland. Oakland’s loss is Miami’s gain.